This striking purple flowering campanula creates a shimmering canopy of colour that contrasts beautifully with the lush green ivy leaves. This charming gift is a great choice that not only looks attractive, it's sure to prompt a smile of delight when they notice the cute teacup planter too. Surprise them with this gift of vibrant seasonal flowers and they're sure to be delighted. To make the best impression we've chosen a selection of bright cerise blooms contrasted with lime green, and then added these lovely warm peachy pink roses called 'Miss Piggy'. An adorable gift. 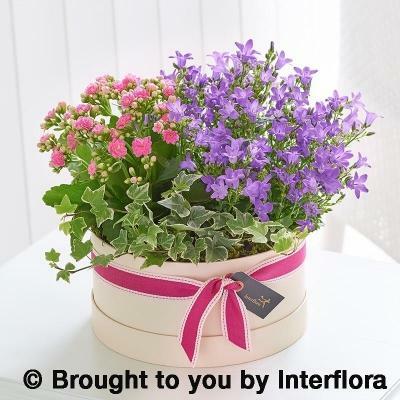 Summer is the season best known for its bright fresh colours, which is why we were inspired by these delightful flowering plants in rich pink and purple. Set side-by-side in a pretty wooden planter and finished with ivy, this gift is perfect for putting pride of place on a sunny window ledge. 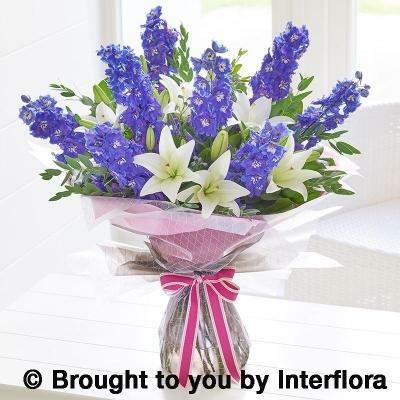 When it comes to flowers, summer is perhaps the most colourful of the seasons. 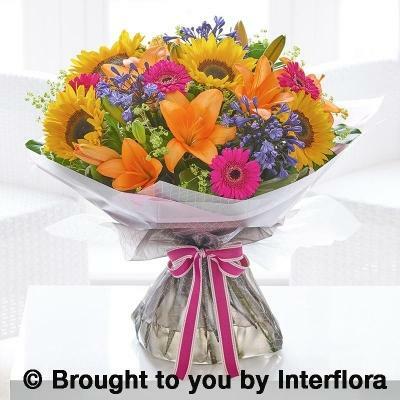 We've captured the warmth of summer sunshine with this beautiful bouquet in vibrant tones. A lovely gift for someone special. We've chosen radiant yellow and hot pinks in this sensational display. 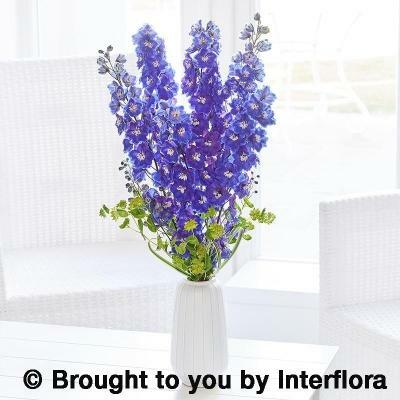 Beautifully presented with a balance of contrasting colours and textures, this glorious summer gift is ready to take pride of place on arrival. 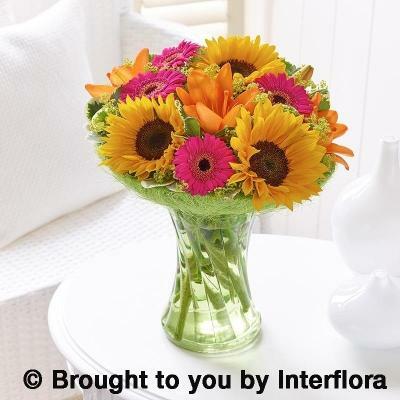 The bright, bold sunflower is an iconic seasonal favourite that always makes a big impression. For this gift we've partnered these sunflowers with gorgeous cerise germini to create a really eye-catching display. 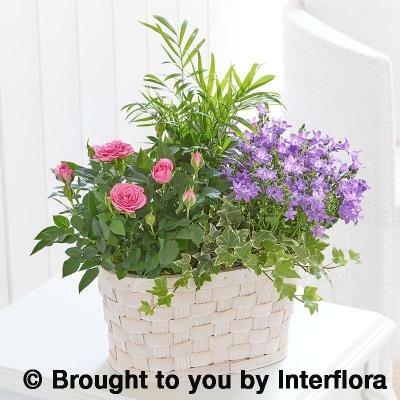 This basket of flowering plants is like a miniature garden that can be enjoyed inside for weeks to come. 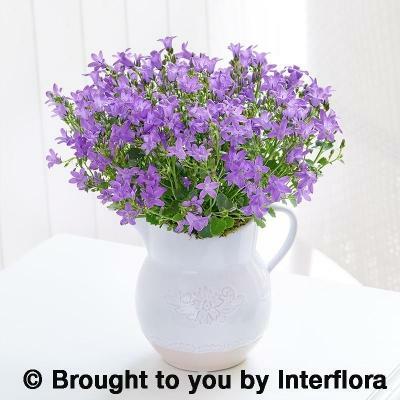 They'll love the pretty white kalanchoe flowers, the purple campanula, and the radiant yellow rose plant will add a burst of summery sunshine to their room. Inspired by the enchanting natural beauty of a summer garden in full bloom, we've designed this gift to capture the spirit of the season. 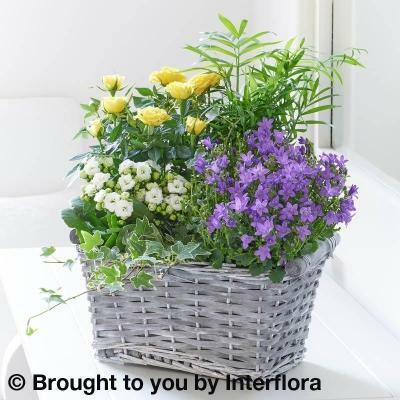 Displayed in a classic basket, this selection of exquisite fresh flowers includes roses, germini and sweet william in cool, fresh tones. 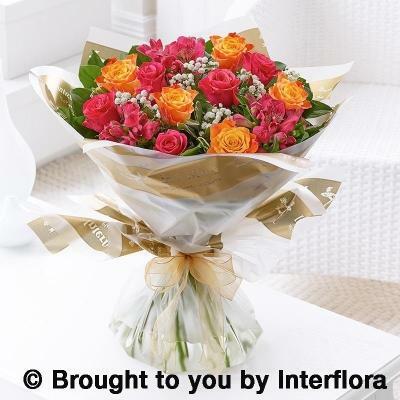 Just like a summer garden in full bloom, this pretty hand tied bouquet is bursting with colour, texture and variety. 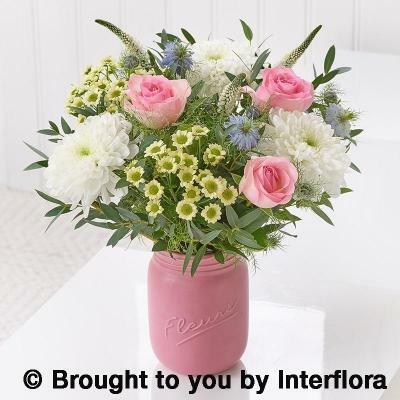 For this selection we included lots of favourites including charming Sweet William, classic dahlias and a timeless pink rose as the centrepiece. This very individual design reflects the many shades of a summer sunset- think how warm gold turns to peach and deeper pink tones. 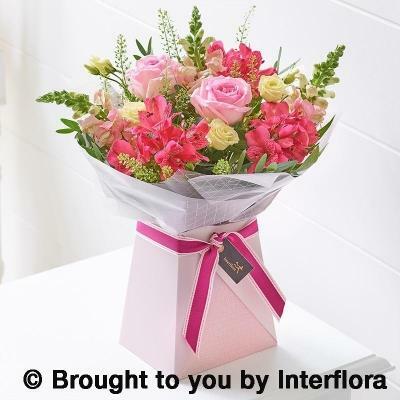 The combination of luxurious fresh roses with delicate alstromeria and a dusting of gypsophila makes a truly stunning hand tied bouquet. Tall, elegant gladioli are a fashionable choice this season. 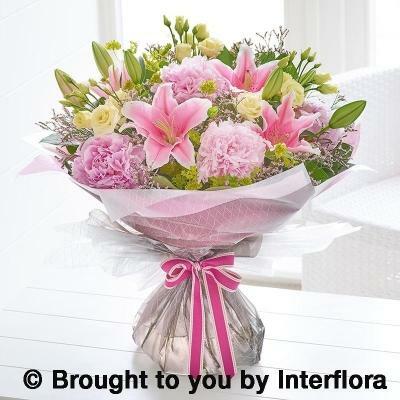 Here we've combined them with exquisite pink roses and lilies plus delicate white trachelium blooms for contrast and softness. This modern design is right up to date and is sure to impress when it arrives at their door. Summer brings an abundance of glorious flower choices in so many dazzling colours- so this bouquet is a wonderful reflection of the season. We've partnered cheery sunflowers and germini with exotic orange lilies to make a statement bouquet that really draws the eye. 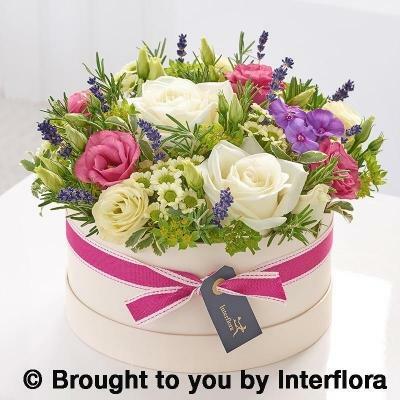 Pretty as a picture and with lots of delicate detail, this charming arrangement makes a delightful gift for someone special. The combination of bright pink germini with pale pink roses and two toned Sweet William looks perfect set against creamy white tones. A gorgeous choice. 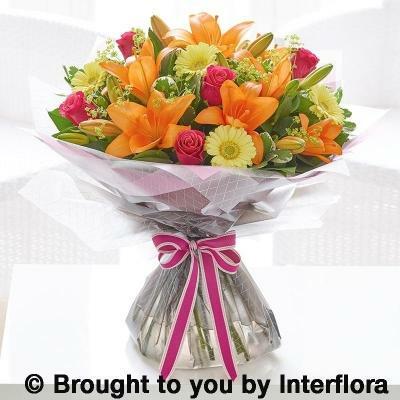 Glowing in radiant orange and gold tones, this beautiful flower arrangement will brighten any home with sunshine or table, they can display this stunning gift immediately and simply savour its natural beauty.